Rawle A. "Tony" Seupaul, M.D., (center) with UAMS Executive Vice Chancellor and College of Medicine Dean Pope L. Moseley, M.D., and Chancellor Dan Rahn, M.D. Jan. 26, 2017 | Jan. 26, 2017 | Rawle A. 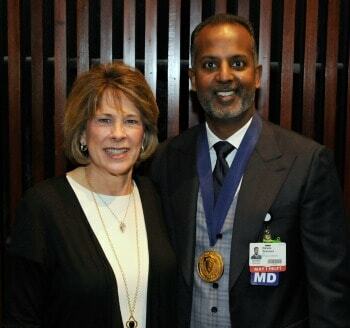 “Tony” Seupaul, M.D., professor and chair of the Department of Emergency Medicine at the University of Arkansas for Medical Sciences (UAMS), was invested Jan. 19 as the inaugural recipient of the Stanley E. Reed Professorship for Emergency Medicine, Trauma and Injury Prevention. 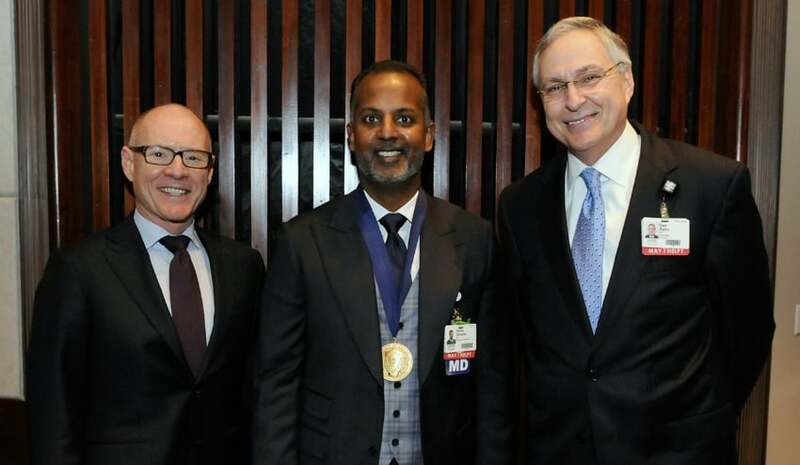 Seupaul was presented with a commemorative medallion by UAMS Chancellor Dan Rahn, M.D., and Pope L. Moseley, M.D., UAMS executive vice chancellor and dean of the College of Medicine. An endowed professorship is the among the highest academic honors a university can bestow on a faculty member and is established with gifts of $500,000, which are invested and the proceeds used to support the educational, research and clinical activities of the chair holder. Those named to a professorship are among the most highly regarded scientists, physicians, and professors in their fields of expertise. Nathan Reed, who now runs the family farm, said emergency medicine and trauma care are needed most in rural Arkansas. Initial funds for the professorship were made in memory of Reed, the noted farmer and public servant who died in 2011 following an auto accident. Reed was a member of the University of Arkansas System board of trustees and was a former Arkansas Farm Bureau president. He served as the first chairman of the UAMS College of Medicine Advisory Board and was a member of the UAMS Foundation Fund Board. Reed played a significant role in promoting Arkansas agriculture products to international markets, leading trade missions to several countries. He grew up on his father’s farm in Marianna. After graduating from the University of Arkansas at Fayetteville in 1973 and obtaining his law degree from the University of Arkansas School of Law in 1976, Reed briefly established a law practice in Marianna before returning to the life of farming he loved so dearly. Reed operated a highly successful family farming operation in Lee and St. Francis counties. He was posthumously named to the Arkansas Agriculture Hall of Fame in 2012, the Arkansas Business Hall of Fame in 2014, and the University of Arkansas College of Engineering Hall of Fame in 2016. Reed’s son Nathan is primary owner and sole operator of the family farm, and spoke at the ceremony about his father. Tributes to Stanley Reed also were made at the ceremony by Robert Shoptaw, former president and CEO of Arkansas Blue Cross & Blue Shield and a member of the UAMS College of Medicine Board of Visitors; and Mark Waldrip, a member of the University of Arkansas System board of trustees. University of Arkansas System President Donald Bobbitt, Ph.D., was also in attendance. Charlene Reed, wife of Stanley Reed and a member of the UAMS Foundation Fund Board, and Dr. Seupaul at the investiture ceremony. “It is so completely appropriate that our friend be memorialized in this way – in a professorship that has a focus in an area of such great human need – because that is so consistent with what Stanley was about,” Waldrip said. Other speakers at the ceremony were Moseley; Michael Gibbs, M.D., professor and chairman of the Department of Emergency Medicine for Carolinas HealthCare System; and Rolly McGrath, M.D., professor and chair emeritus for the Department of Emergency Medicine at the Indiana University School of Medicine. “Tony was self-directed, self-educated, and he has accomplished so much with this discipline of evidence-based medicine,” McGrath said. Seupaul joined UAMS in 2013 from the Indiana University School of Medicine, helping greatly expand the Department of Emergency Medicine. “I want to make special mention of the late Dr. Marvin Leibovich,” Seupaul said. “It was him along with Stanley and his family that really made today possible.” Leibovich, who died in 2015, served as department chair prior to Seupaul and was instrumental in developing emergency medicine programs across Arkansas. Seupaul noted that UAMS created the Department of Emergency Medicine in 1983, a mere four years after emergency medicine was named a medical specialty. “That is remarkable – that UAMS rode the crest of that wave as an early adopter, recognizing the field of emergency medicine for what it is,” Seupaul said. 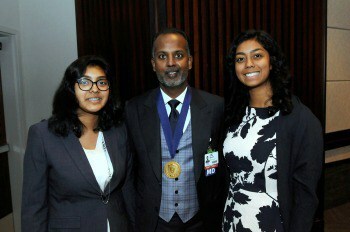 Dr. Seupaul and his two daughters, Savannah and Taylor. 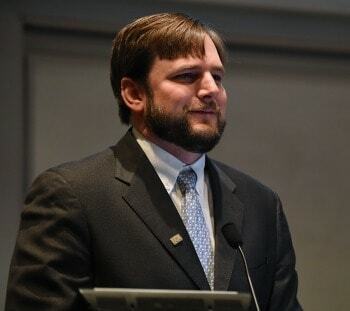 Seupaul mentioned the third-year rotations his residents do in rural areas of Arkansas, and how more residents are choosing to stay in rural areas after their residency. “That is one of the many ways that we will expand emergency medicine from UAMS into the rural areas to improve health care, and I think that’s exactly what Stanley would’ve wanted,” Seupaul said. Seupaul has focused his academic career on evidence-based medicine education and the application of science to health care. Evidence-based medicine integrates clinical experience with the best-available research information. Seupaul graduated from Northwestern University’s Honors Program in Medical Education in 1997, with Alpha Omega Alpha honors. He completed his emergency medicine residency at Carolinas Medical Center in Charlotte, N.C., where he was a chief resident. Following his residency, Seupaul joined the Indiana University School of Medicine’s Wishard Based Faculty in the Department of Emergency Medicine in 2000, its inaugural year. Since Seupaul arrived in 2013, the Department of Emergency Medicine has grown tremendously. The department now has its first division, EM ultrasound; its first fellowship, ultrasound; and first offsite emergency department, at Baptist Health Medical Center-Conway; and a 16-bed clinical decision unit. Seupaul has been named to the UAMS Circle of Excellence dean’s list, has twice been chosen by students to receive the Red Sash Award for excellence in teaching, and received the College of Medicine’s Dean’s Educational Incentive Award in 2013. He was also recently elected chief of staff for UAMS Medical Center. He has participated in several funded clinical trials and has authored over 70 peer-reviewed publications, in addition to a number of scientific abstracts, book chapters and commentaries.